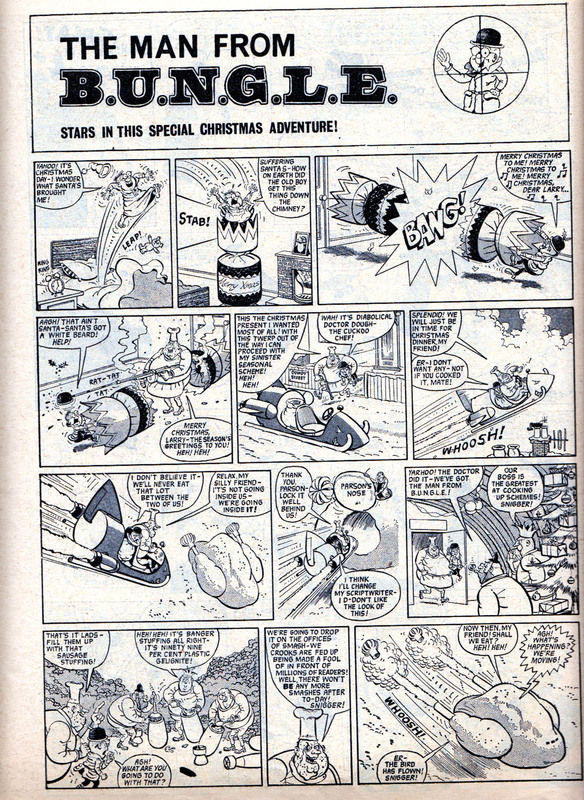 Rather than my usual flashback to a bygone New Year comic I thought this year I'd look into the crystal ball to highlight a few of the comics we can expect to see in 2012. 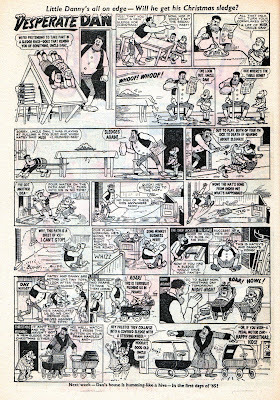 Hardware is another brand new British comic anthology scheduled for 2012. 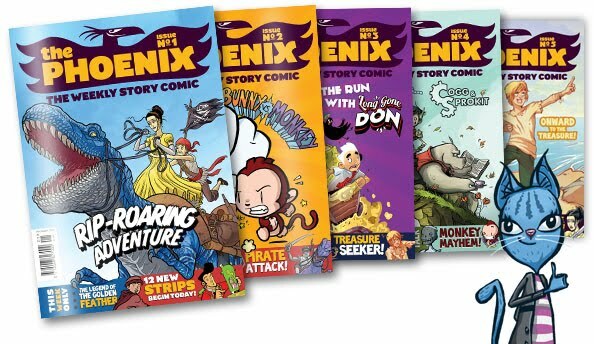 More details on this exciting new venture over the coming months! Mark Millar and Dave Gibbons have revealed the title of their collaboration, - The Secret Service. Coming in February from comic specialist shops! 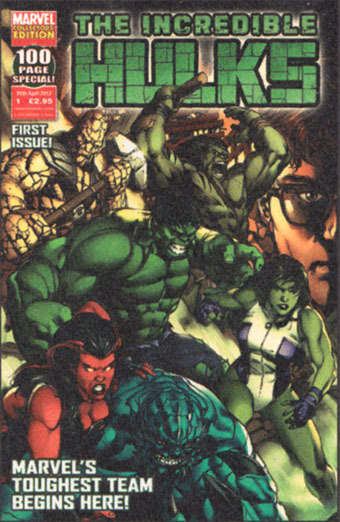 Panini UK will soon be ending their Fantastic Four Adventures comic with issue No.28 but March sees the launch of The Incredible Hulks No.1 (yes, for better or worse there's a team of Hulks now). 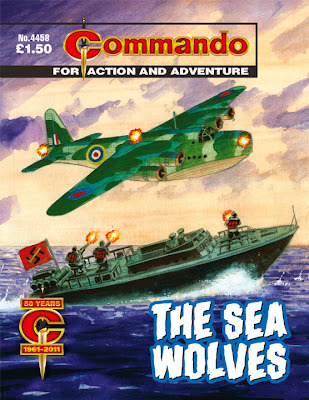 The 100 page debut issue will be on sale in newsagents for £2.95. 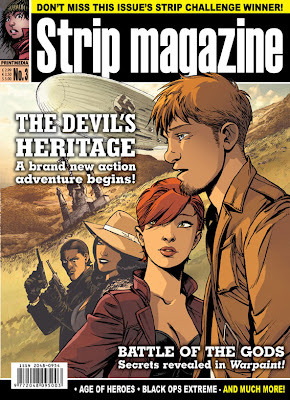 Issue 1 reprints the American issues #612 to 614. 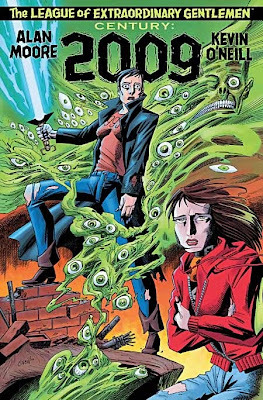 Another graphic novel to look forward to next year is the new The League of Extraordinary Gentlemen title Century:2009. The latest book in the saga by comic gods Alan Moore and Kevin O'Neill. 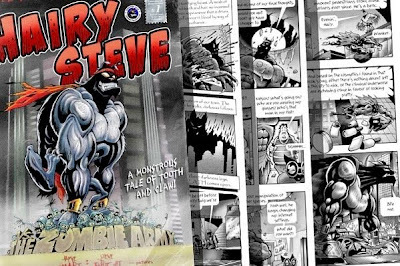 Hairy Steve should be bounding your way soon, courtesy of Jamie Smart and Steve Bright. The titanic twosome have been uploading pages as they're completed but personally I'm waiting until the comic is published to appreciate it in one sitting. 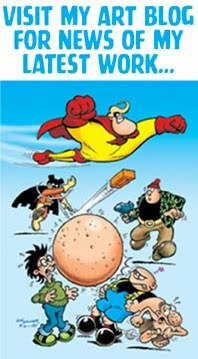 2012 is also the year of three comic anniversaries. 2000AD celebrates 35 years of publication in February, Toxic reaches 10 years in September, and The Dandy notches up a record-breaking 75 years next December. 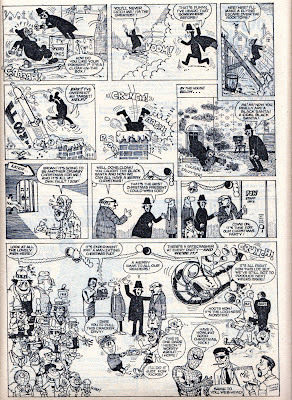 Expect some celebratory treats throughout the year including the return of some classic favourites in The Dandy Annual on sale in the second half of the year. 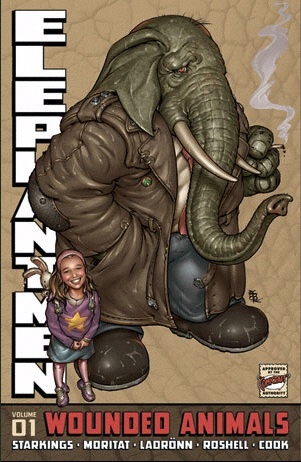 ...and if I ever find enough spare time, I intend to collect the Brickman pages I did for Elephantmen comic into a one-off Brickman Returns full colour comic I'll publish myself. 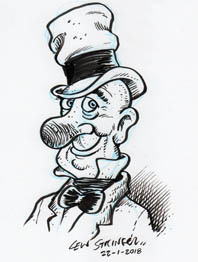 Here's a taster, but as yet I've no idea when the comic will be published. 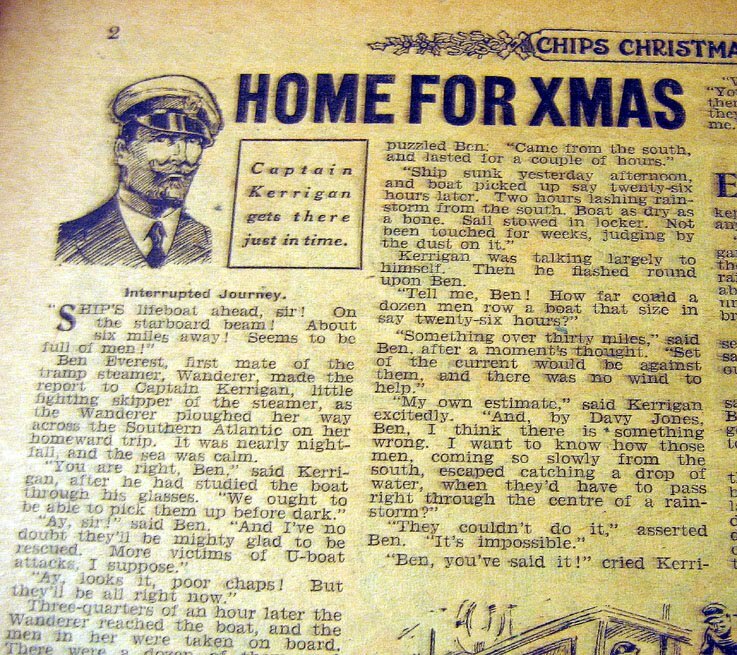 Hopefully before next Christmas! These are just a few of the comics coming your way in 2012 and there'll be many other surprises as the year unfolds. 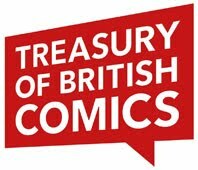 No doubt that it'll be another mixed year of stumbles and triumphs (as is everyone's year) but the important thing is that the British comics industry is far from dead. 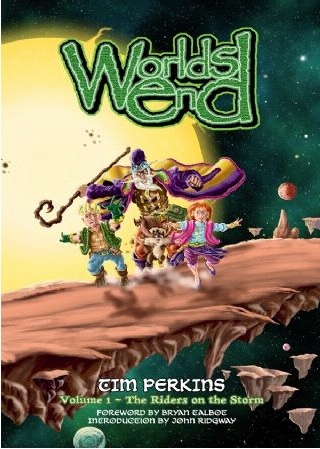 Let's hope it's a very Happy New Year for creators and readers alike as we forge ahead into 2012! 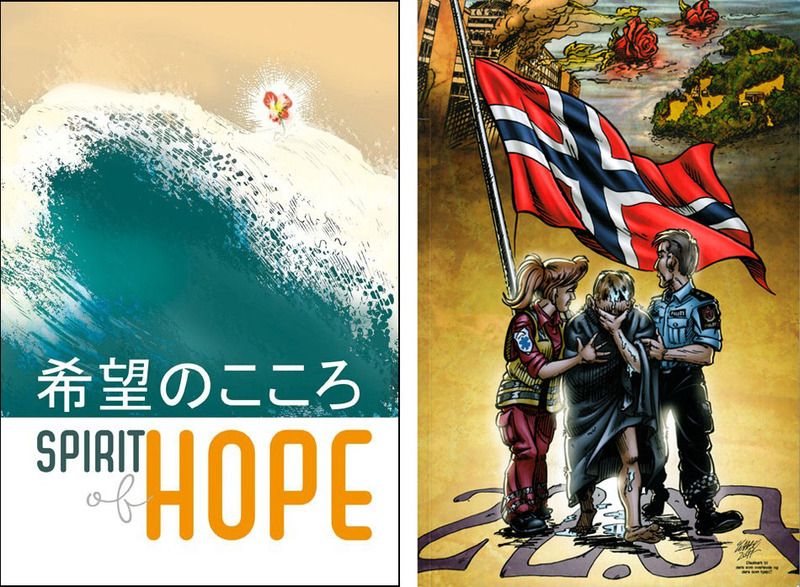 The two books that I was most proud to be asked to contribute to in 2011 were the two that I wish hadn't had cause to be published. 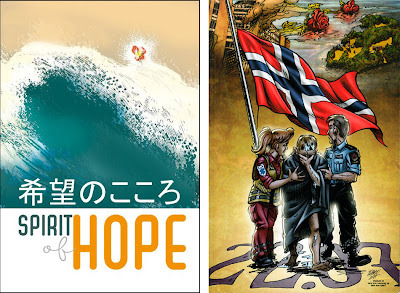 Angered and devastated by the event Raptus Comic Festival organizer Arild Wearnes asked comic creators he knew to contribute their feelings to a book that would be sold at the September Raptus event in Bergen to raise money for the families and survivors of the atrocities. 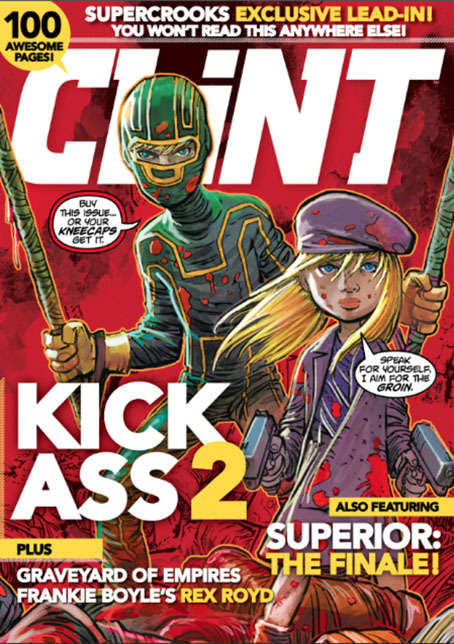 22.07 features material by Lise Myhre, Mike Collins, Dave Windett, Charlie Abbø (cover), Siri Petterson, Mike Carey, Kim Holm and many others. 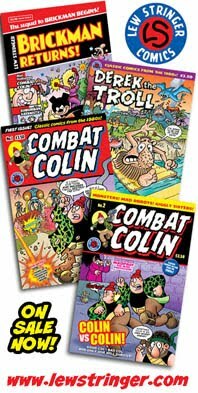 As I said, two books I was privileged to contribute my services to, but in an ideal world would never have had cause to be published. 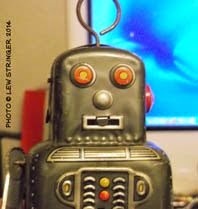 Let's hope that 2012 brings brighter days for everyone. 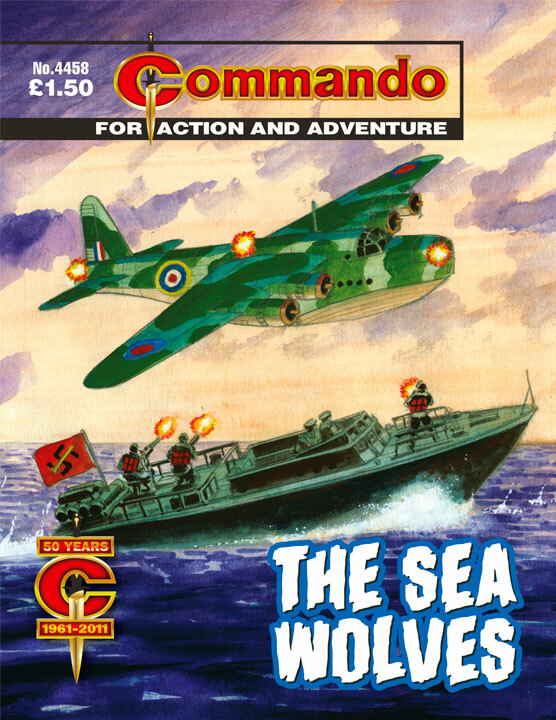 The latest four issues of D.C. Thomson's digest-sized adventure comic Commando are in the shops now, rounding off the title's 50th anniversary year. 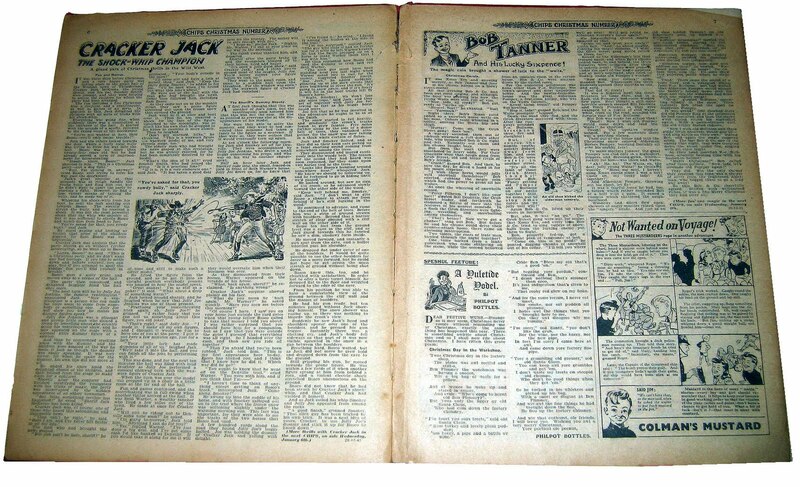 "The good news" says editor Calum Laird, "is we’ve slightly increased our sales over the year and our subscriptions have increased by a whopping 45%. This is great news in the current climate." The Valley of Destruction, the Germans called it. 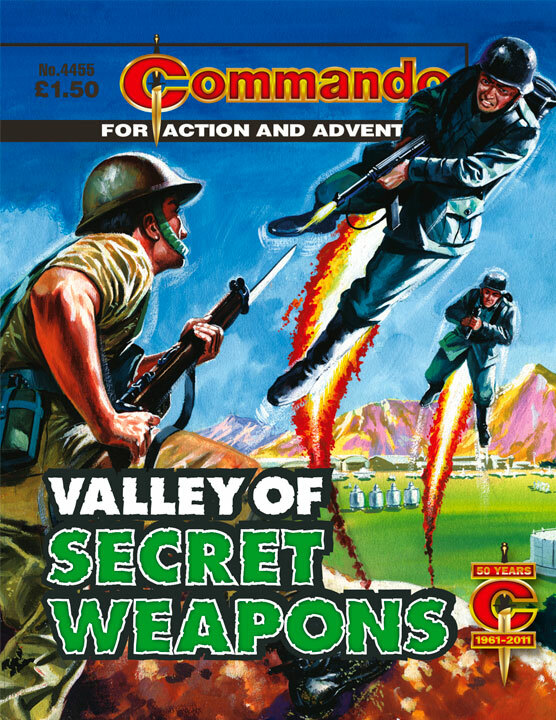 It lay deep in the heart of the Tyrolean mountains, and there Germany’s most brilliant scientists worked night and day building Hitler’s deadly “V for Vengeance” weapons. 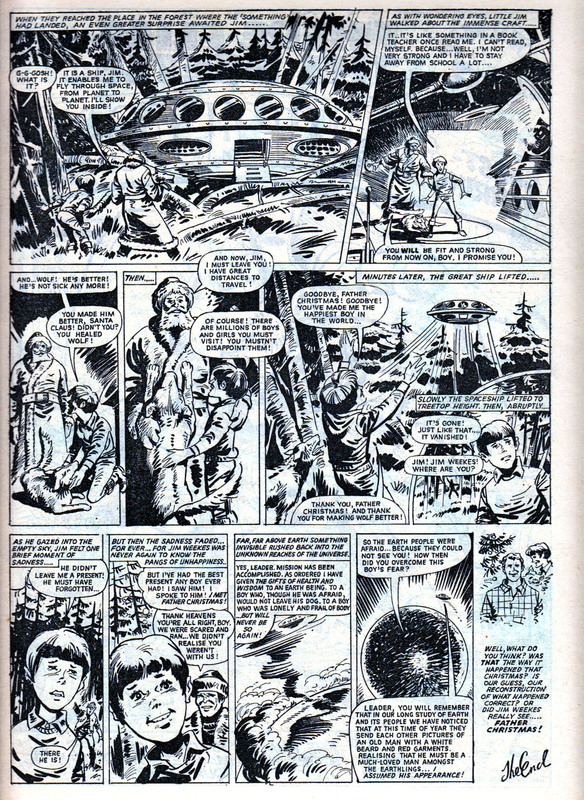 Sun-ray cannons, flying saucers, sound cannons, rocket-propelled tanks and jet-propelled soldiers – strange, terrifying weapons, years ahead of their time. 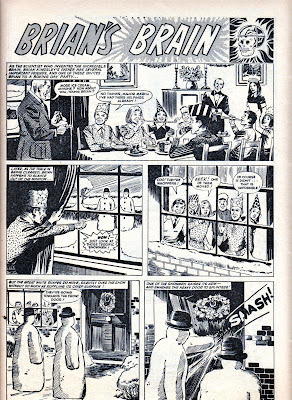 They were all there in that valley, being made ready to unleash on Britain. One look at the cover tells you all you need to know about this story — it’s a real flight of fancy. (And I don’t just mean because there are Germans with jetpacks.) Or is it? 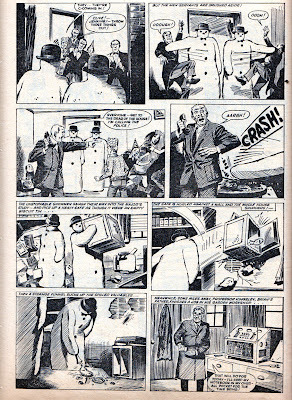 As more information on the Third Reich’s secret weapons programmes comes to light, some of the gear drawn up by Ortiz doesn’t seem so far-fetched. 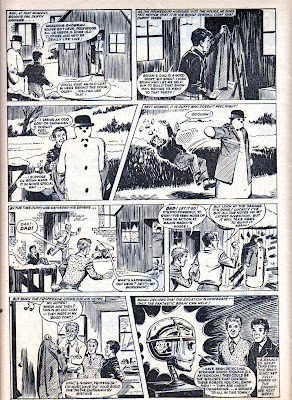 Perhaps author Eric Hebden who had been a Major in the British Army had some inside knowledge…who knows? 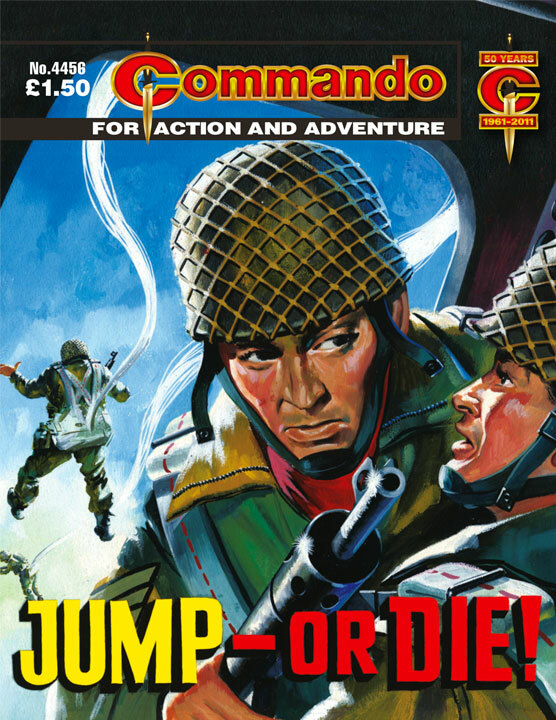 Commando 4456: Jump – Or Die! The dull throb of the Dakota’s engines pounded remorselessly in the paratroopers’ ears as they filed in to their jumping order. 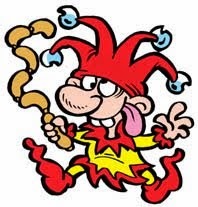 Nobody spoke, nobody smiled, nobody spared a kindly glance for the next bloke in line. 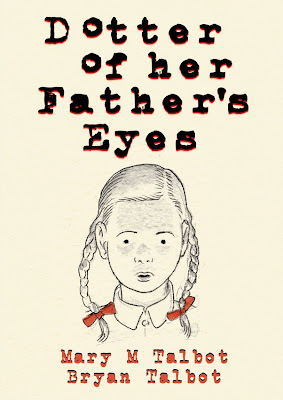 Lips were dry and taut, and eyes glowed with a mixture of determination…and FEAR! 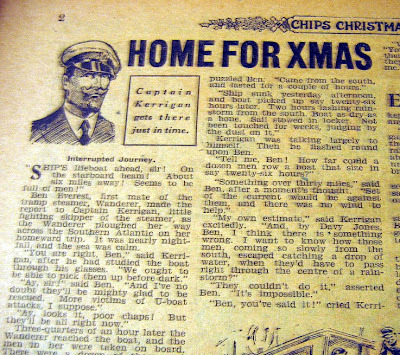 Which was all wrong, because he was meant to be officer in charge of this mission, an example to all the others. 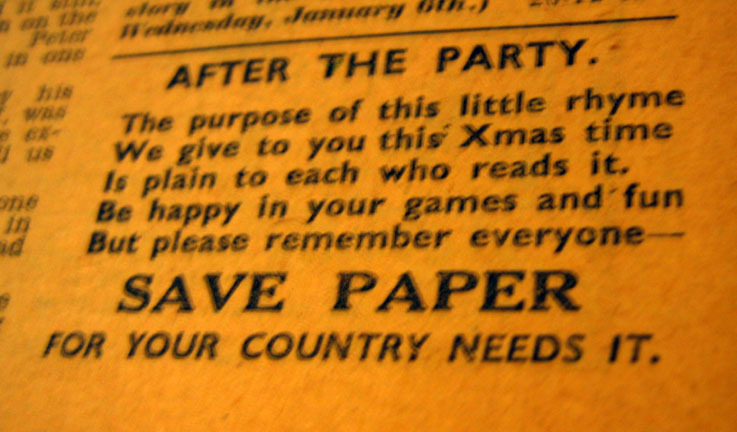 British Paras were involved in no end of covert operations in the Second World War. 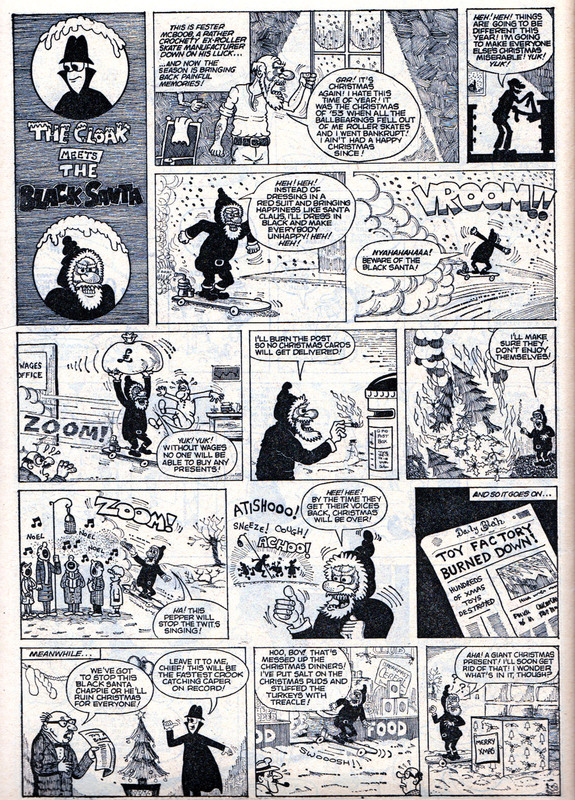 This is a problem because most of them took place under the concealing cloak of darkness. 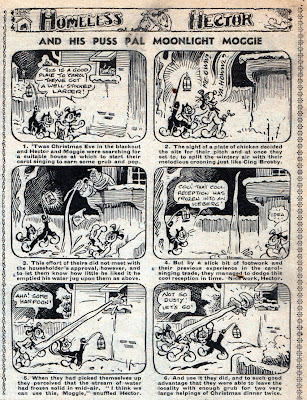 This doesn’t seem to have put artist Cortes off, however. 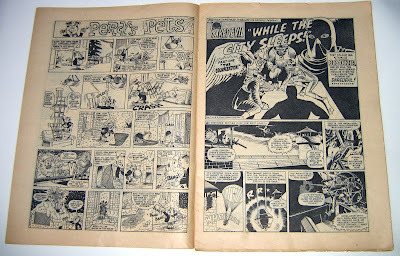 His drawings of the Paras in action at night make superb use of black ink without losing any detail and without looking anything apart from, well, night. Kellie’s script is as full of action and conflict as you’d want, while Ken Barr’s cover leaves you in no doubt about the menace in the title. As a fireman during the London Blitz, Ted Roscoe was exempt from Armed Forces duty, as his was a reserved occupation deemed important to the war effort. 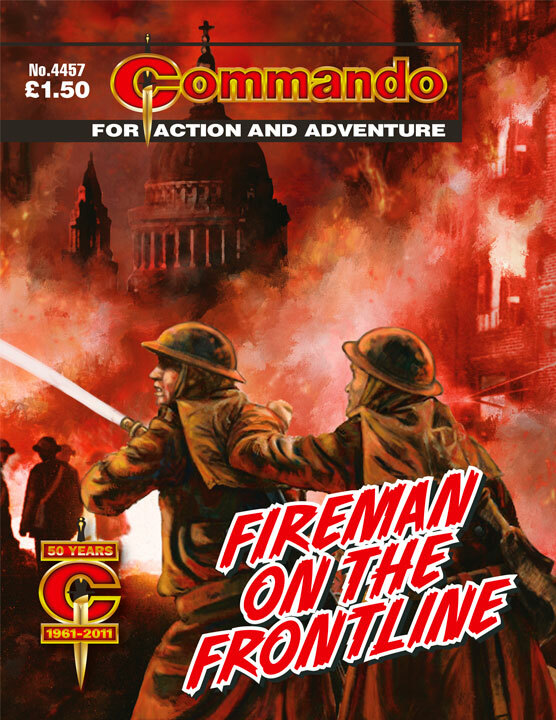 He knew all about danger just the same, though, dodging bombs as he fought fire after fire. 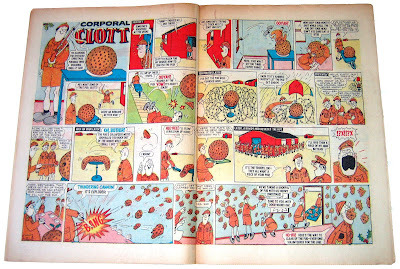 However, the Army needed Ted’s expertise too and he soon called to the front line. 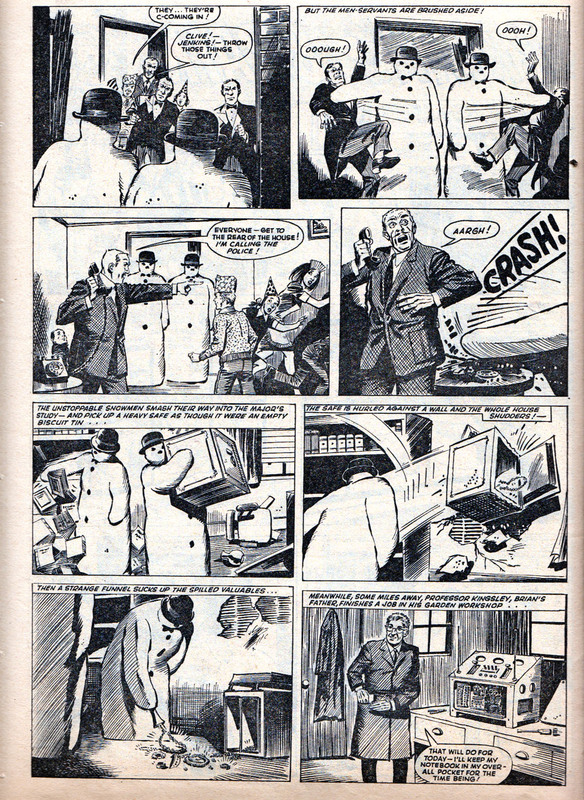 Here Ted found himself embroiled in a deadly game of survival, with not just the enemy’s hand against him! And, just as amongst packs of wolves, there had to be a top dog — would he be British or German? 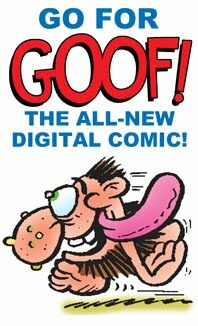 Comicraft's New Year Font Sale! 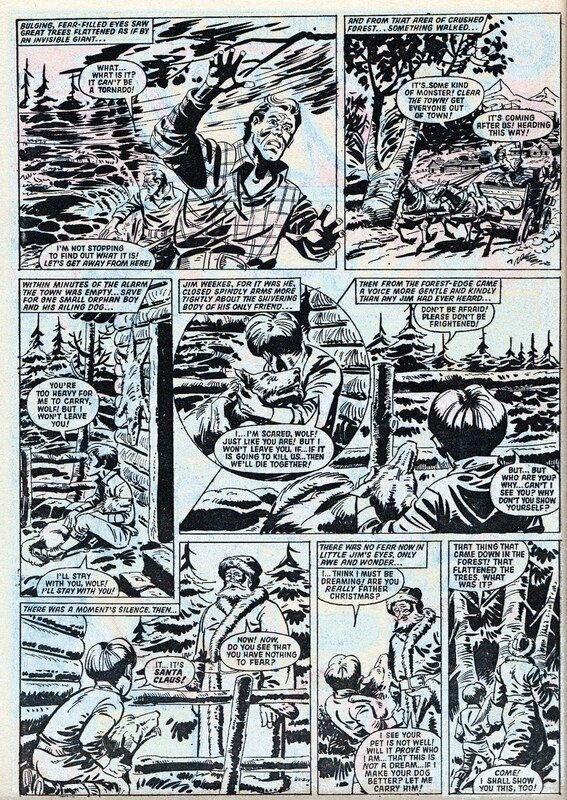 Comic book lettering is just as important as the artwork in the presentation of a professional looking page. 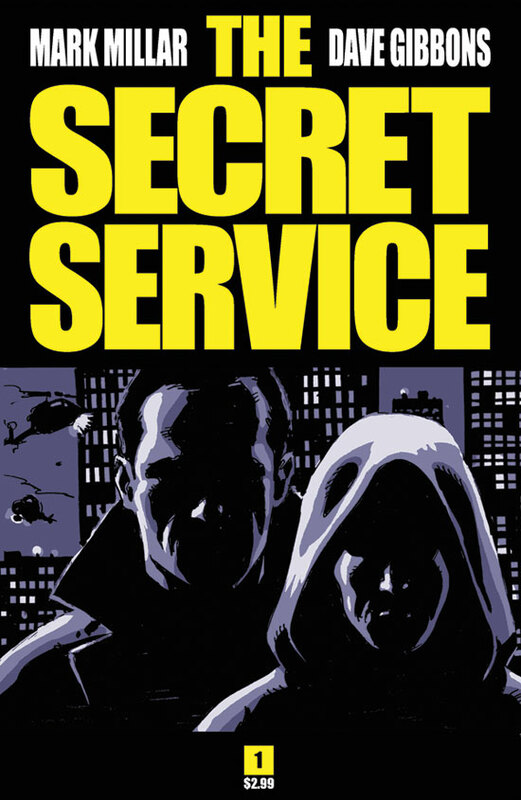 Bad dialogue lettering can distract from the flow of the story and poor display lettering can diminish the impact of a cover. 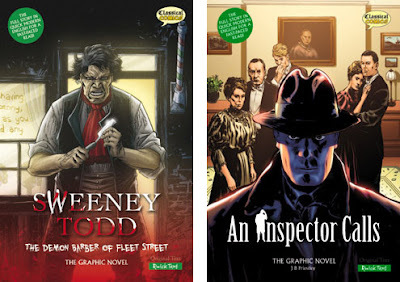 If you are thinking of putting together your own comic in 2012, or if you're an established publisher, or you want to brighten up your website, it could be a wise move to invest in a few smart top quality fonts from the people at Comicraft on January 1st! 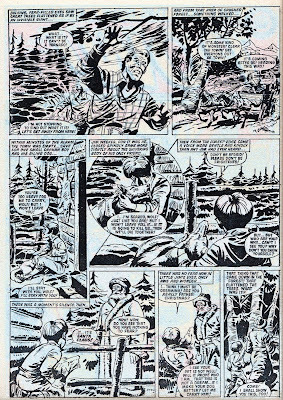 Yes, it's Comicraft's Annual New Year's Day font sale and all fonts will, for one day only, be available at the bargain price of $20.12 each! OK, some of you will be wondering why you should bother to buy fonts when there are free ones out there for the taking. 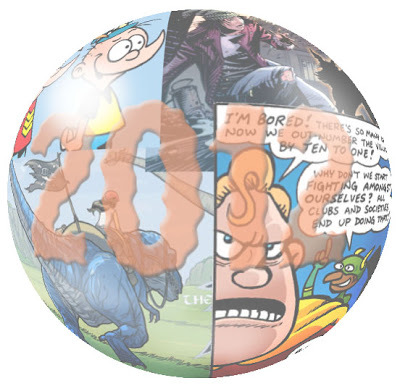 Well, some of them are a poor substitute for specially designed comic book fonts. 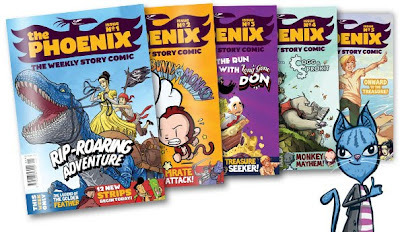 Richard Starkings and John Roshell have years of experience in producing top quality comic book lettering, logos and sound effect fonts for Marvel, DC and many more. You get what you pay for, although in the case (no pun intended) of the font sale you get better than what you pay for. 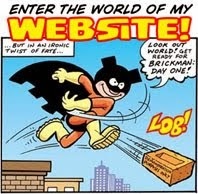 Anyway, if you're interested take a look at the easy to navigate Comicraft website (which is designed using their fonts, showing how effective they can be). 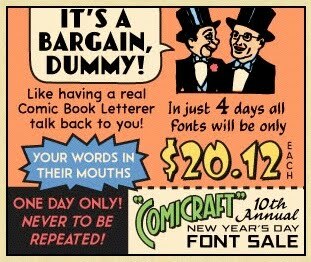 Remember, the font sale is for one day only on January 1st! 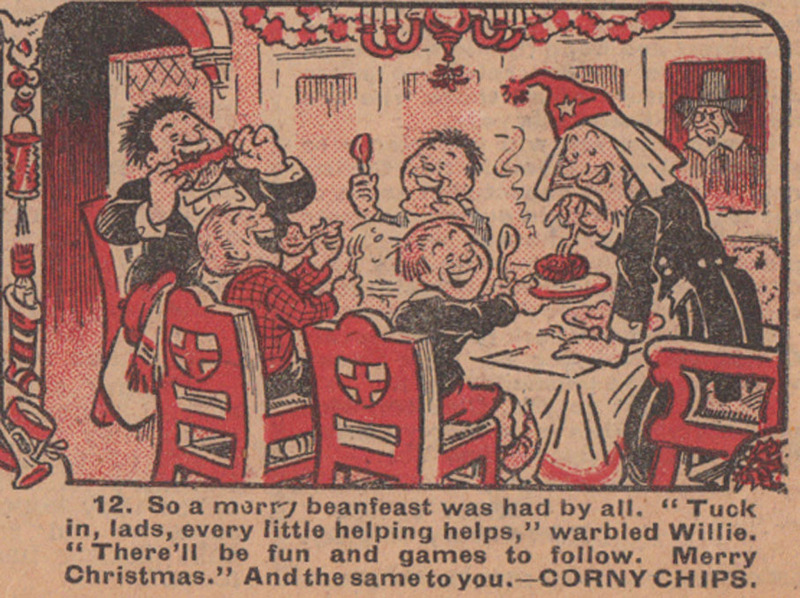 We've arrived at our final destination on the long time trip through Christmas comics of the past. 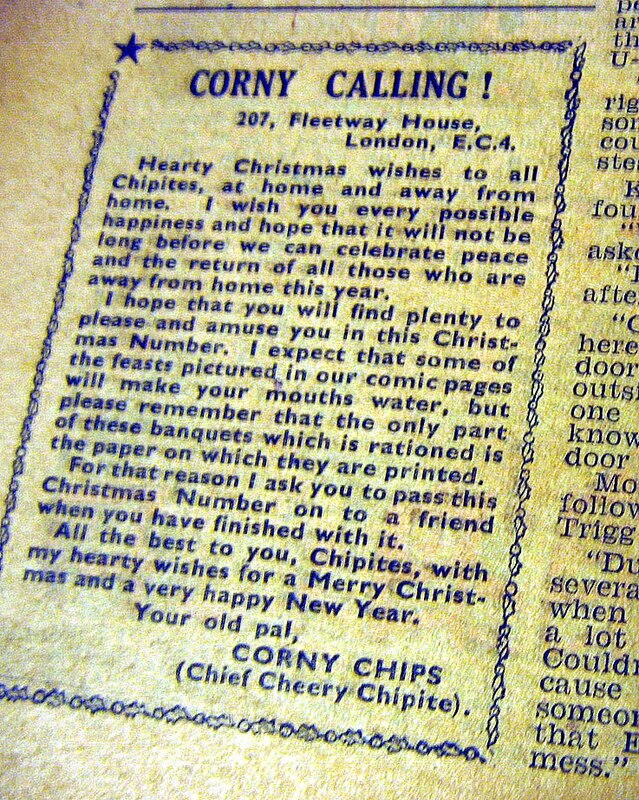 It's December 1942 and in the dark days of the war comics are doing their bit to brighten the spirits of the young generation. Illustrated Chips and The Joker modified its logo for issue 2,695 to adorn its cover with a special festive title, the Chips Merry Xmas Number. 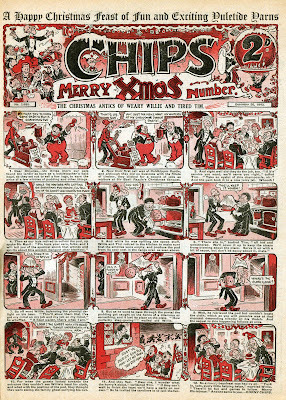 Underneath the logo, The Christmas Antics of Weary Willie and Tired Tim (Chips' cover stars since Tom Browne created them in 1896) were drawn by Percy Cocking from 1909 until the final issue in 1953! 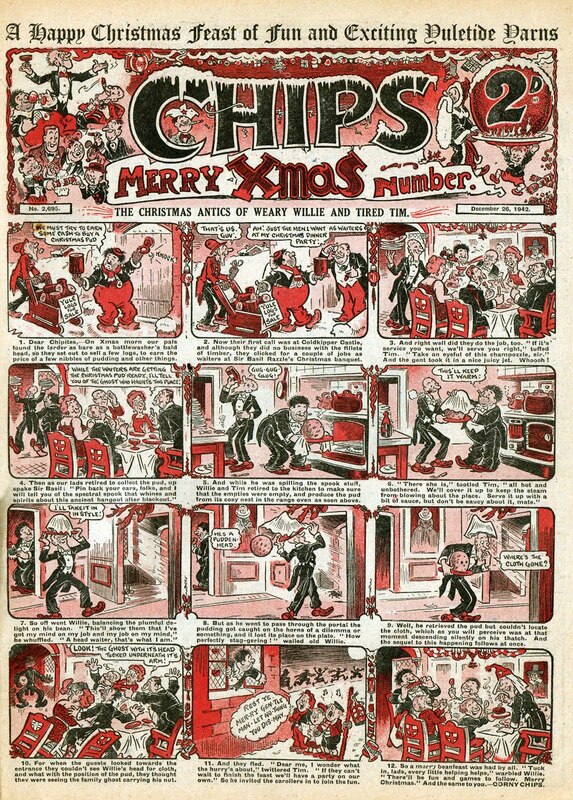 At this time, Chips, like most wartime comics, had reduced its frequency from weekly to fortnightly. 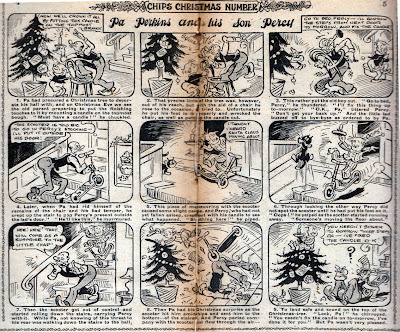 By this stage of the war the comic's humour strips were trying to distract readers from the grimness of warfare but the text story Home for Xmas tried to put an uplifting aspect on the situation. 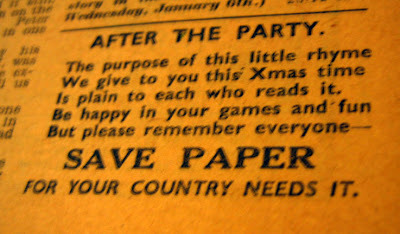 The Editor's message also tried to be warming and upbeat, reflecting the hopes of many that the war would soon be over. 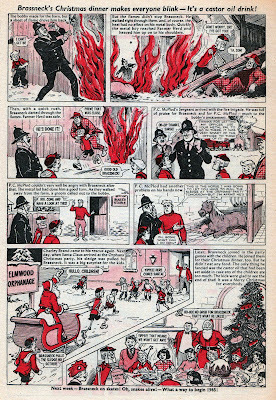 Dane the Dog Detective was a predecessor to The Dandy's Black Bob and his text story tales ran in Chips for many years. 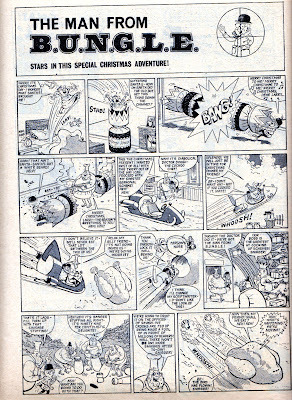 Here he's involved in the Mystery at Mistletoe Manor. 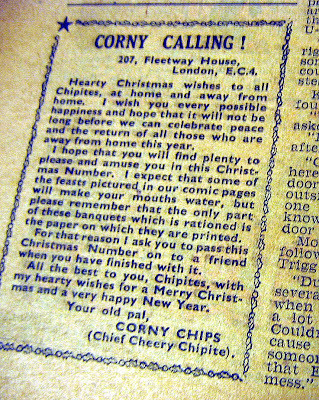 Pages 6 and 7 featured more text stories plus a poem by "Philpot Bottles" Chips' fictional office boy. 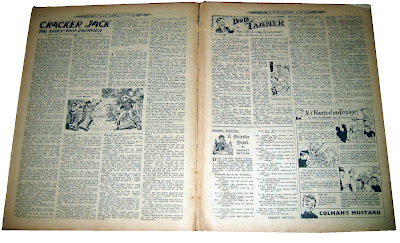 The back page provided a great finalé to the issue. 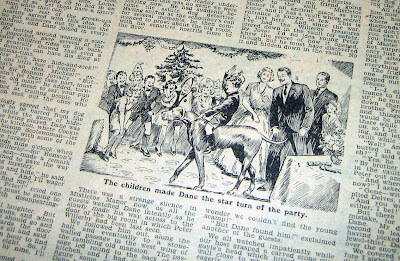 I'm sure The Casey Court Xmas Party must have given readers lots of pleasure studying the busy illustration. 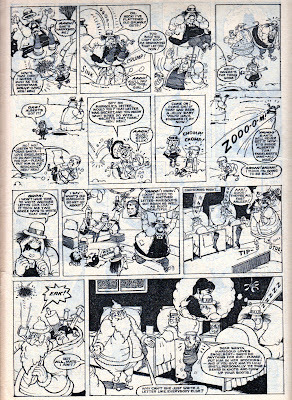 Beneath, The Merry Skylarks of Alfie the Air Tramp (a strip that Chips had inherited from Joker comic) is by John Jukes I believe. 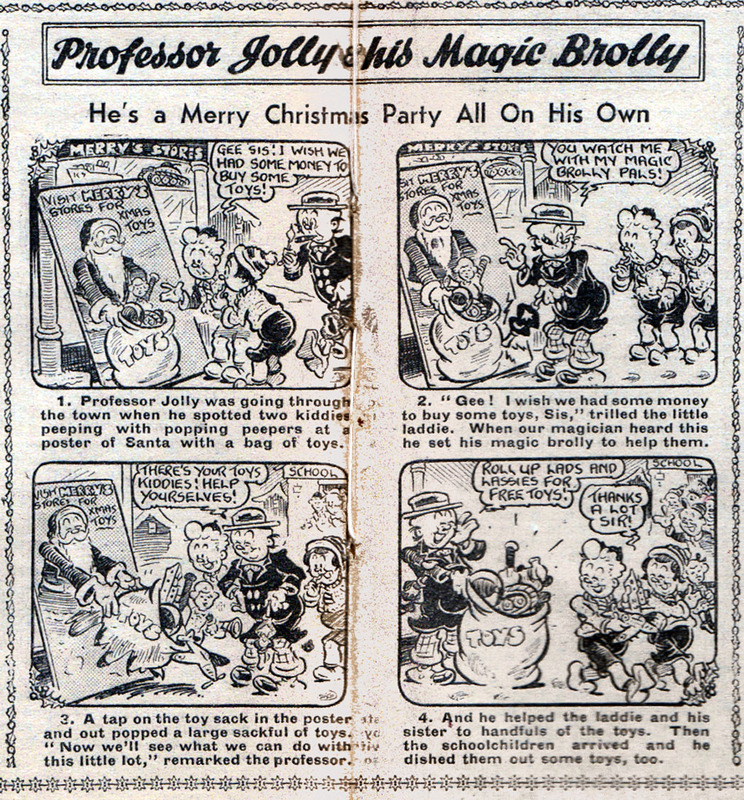 Incidentally, today marks the fifth anniversary of this blog, so I'd like to thank you all for visiting Blimey, whether you're a new visitor or someone who's been following the blog for the last five years. 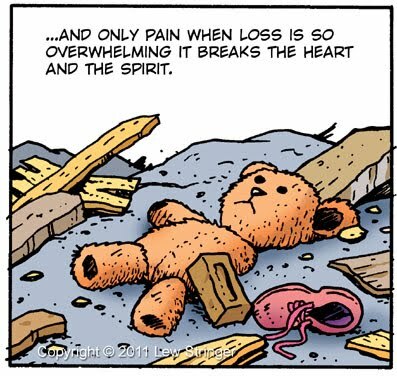 After the frantic pace of the last few days I'm taking a break for a short time now but will return with more comics from the past and present in the not too distant future. 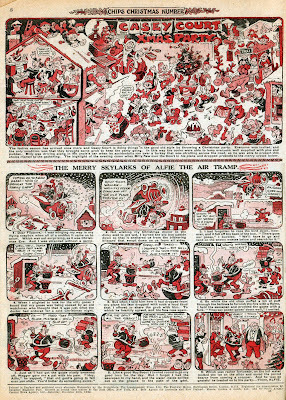 In the meantime may I wish you all a very Happy Christmas and a prosperous 2012! 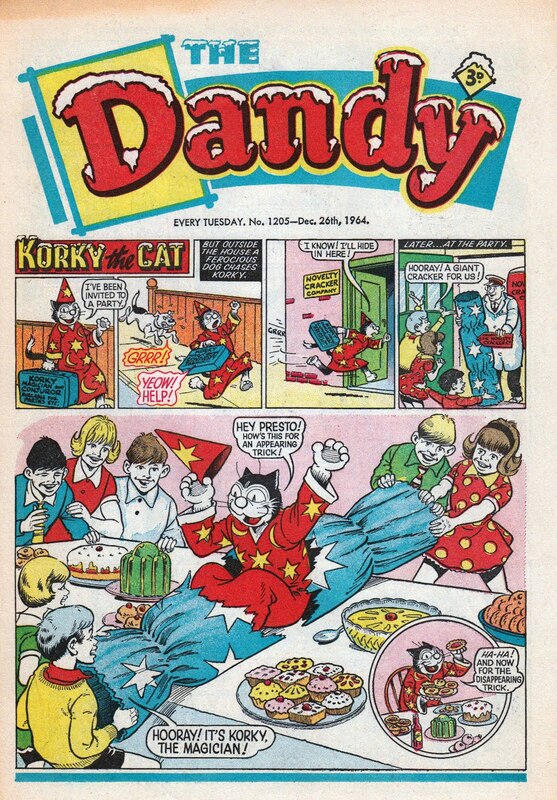 The Dandy was the first comic I read regularly and this was the first Christmas issue of a comic I had. 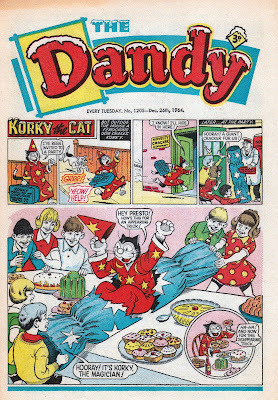 Dated December 26th 1964 (but published on December 21st) The Dandy No.1205 kicks off with the usual Korky the Cat cover strip drawn by the excellent Charlie Grigg. 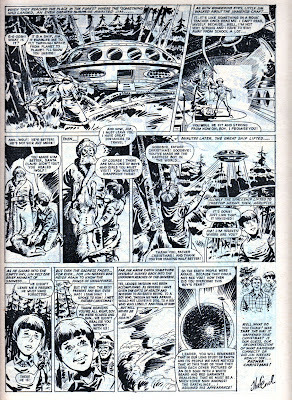 Every page of this 16 page issue is a gem but here's a few highlights. 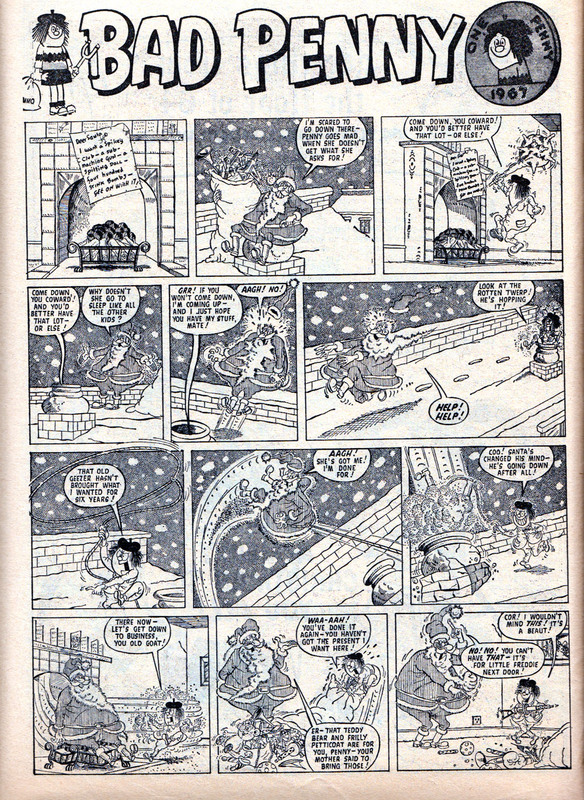 On page 2, the brilliant artistry of Dudley D. Watkins on Desperate Dan. 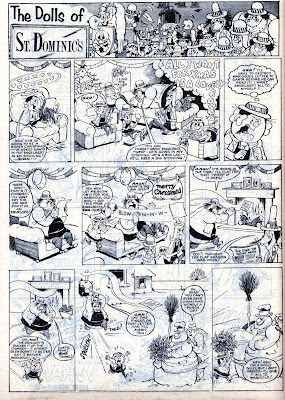 Eighteen panels on one page, at a time when Mr.Watkins was also drawing several other regular pages for other comics. How did he do it? Truly one of the greats. On pages 3 and 4 was a marvelously wintry Brassneck story drawn by Bill Holroyd from an era when policemen patrolled on pushbikes. 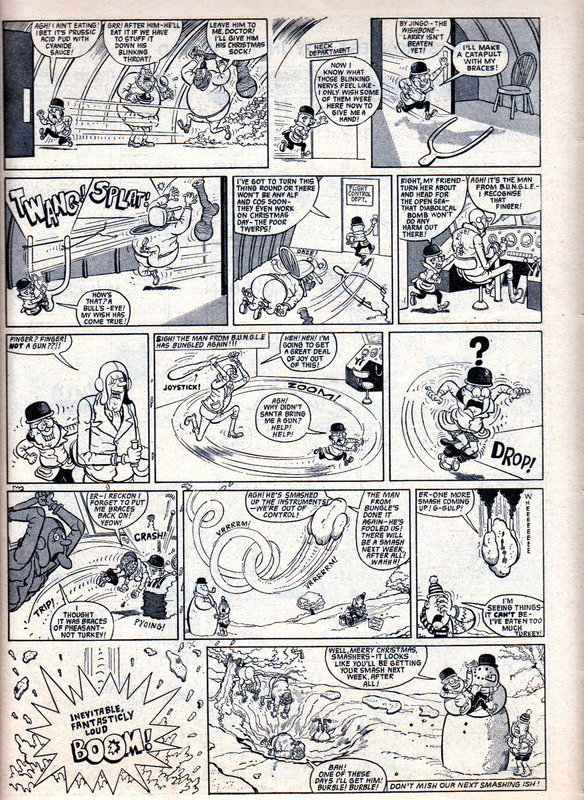 Brassneck was a relative newcomer to The Dandy at the time and this was only the fourth episode of his first series. 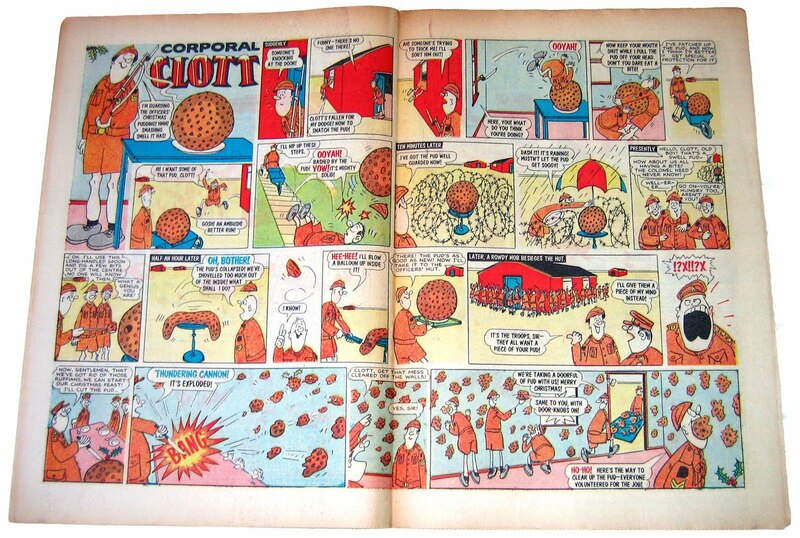 For me, the funniest strip in this issue was the Corporal Clott story across the centre pages. With Davy Law's ability to produce perfect comedy timing in his artwork combined with the hilarious dialogue everything about this episode is brilliant. 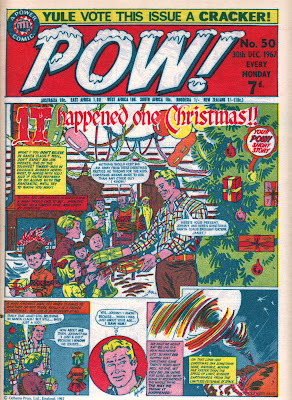 Coming up: The final Christmas comic under the spotlight. 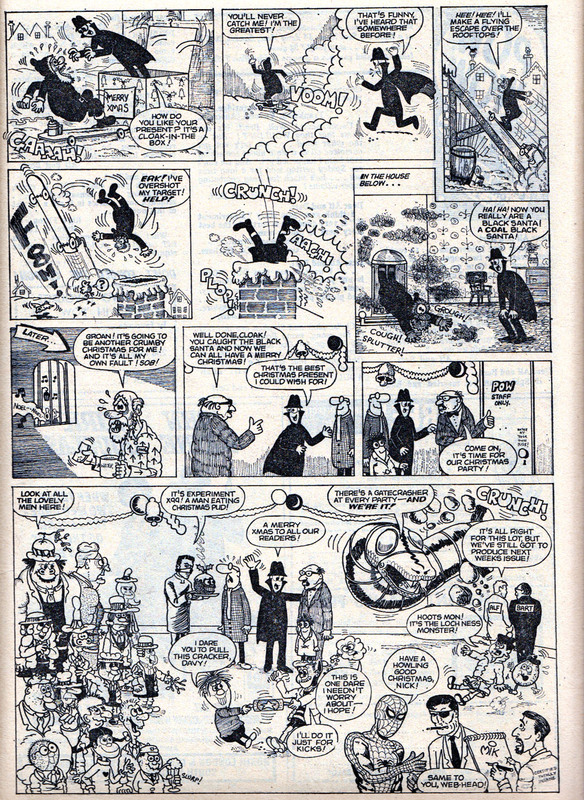 Will we go forward from 1964, or back? Find out soon! 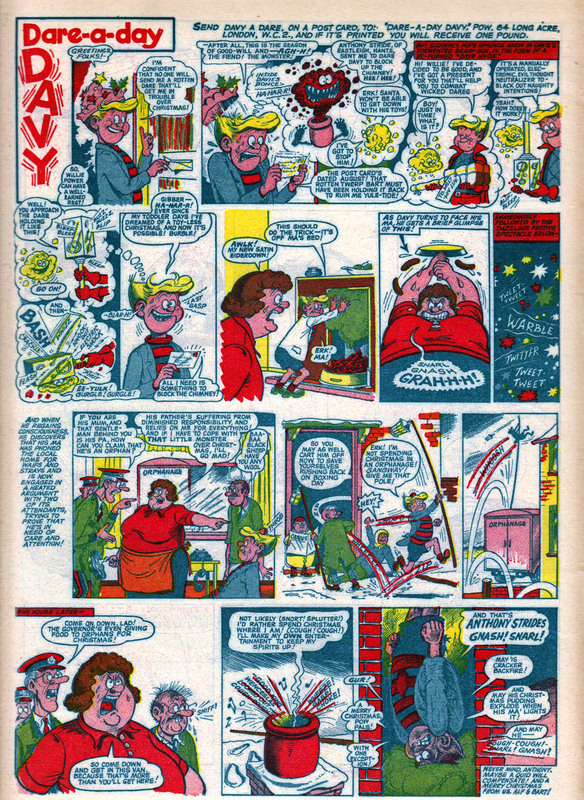 The Dolls of St.Dominic's is a good example of how daring the Odhams comics were compared to their Fleetway counterparts. 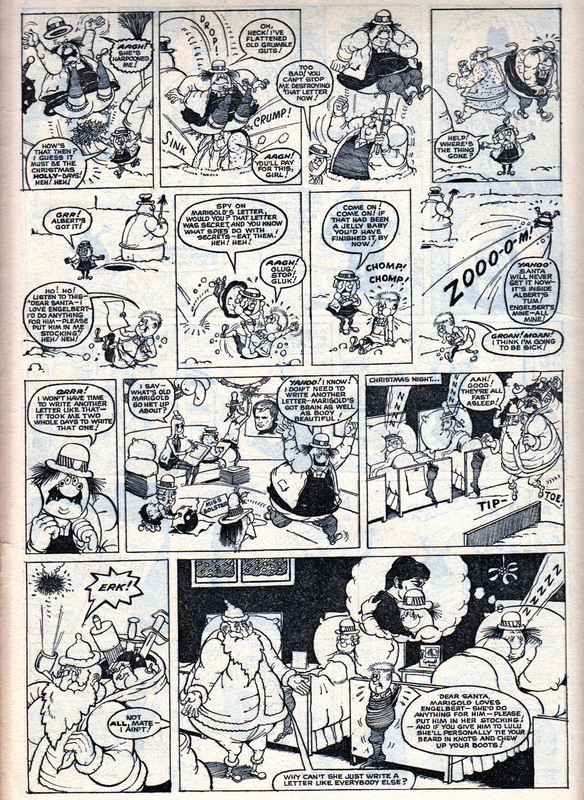 The premise owes more to the schoolgirls of St.Trinians than The Bash Street Kids but artist Ron Spencer was still encouraged to draw it in a Leo Baxendale style. For those of you born long after the 1960s, "Englebert" refers to Englebert Humperdink, a Leicester-born singer who reached the heights of pop stardom, and I believe still has a residency in Vegas. 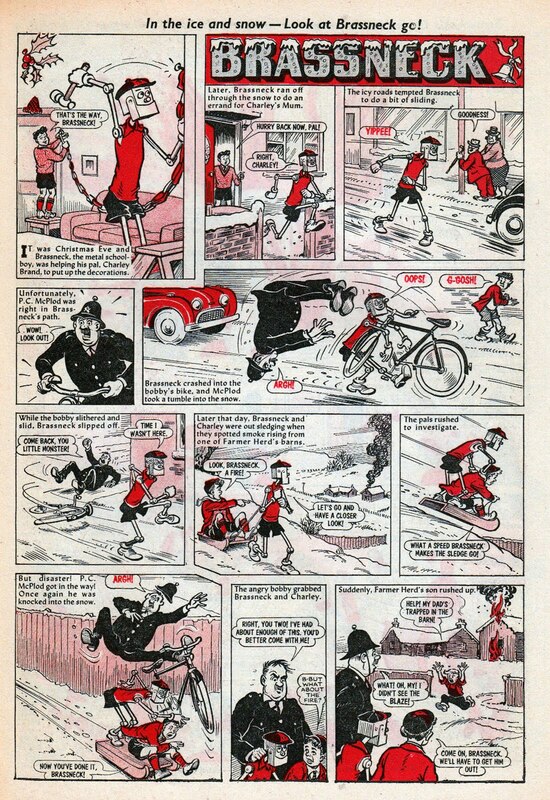 The favourite comic strip of many Pow! 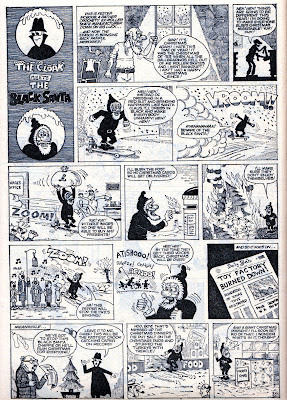 readers, including myself, was The Cloak, written and drawn by Mike Higgs. 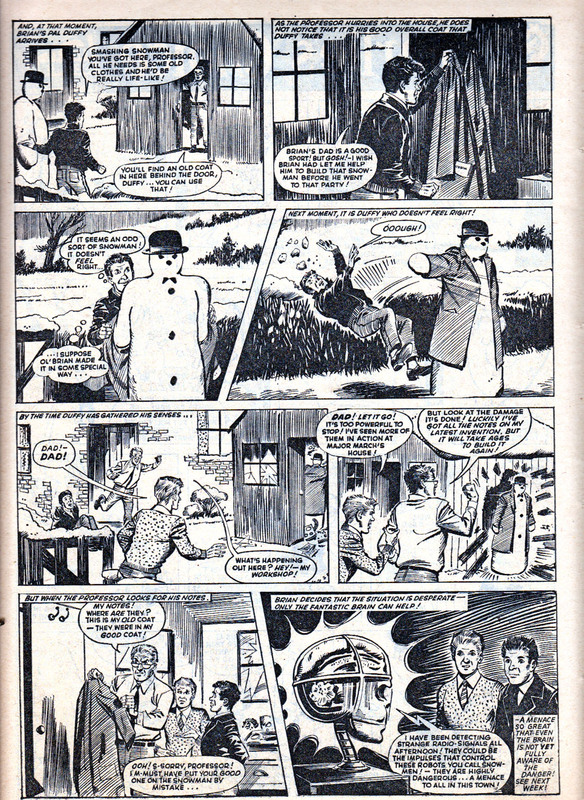 Pre-dating Sparky's I-Spy this black-garbed super spy usually appeared in serials of about six weeks in length but for Christmas Mike contributed a complete story. 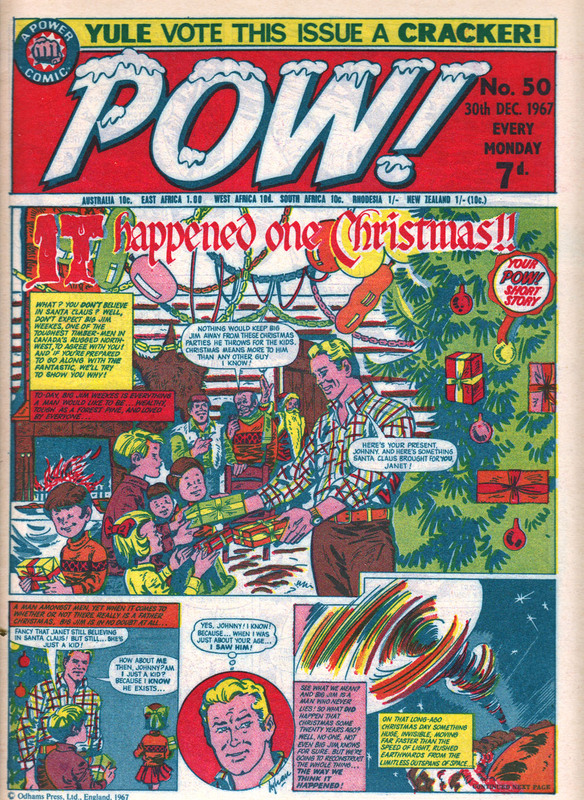 Note all the Pow! 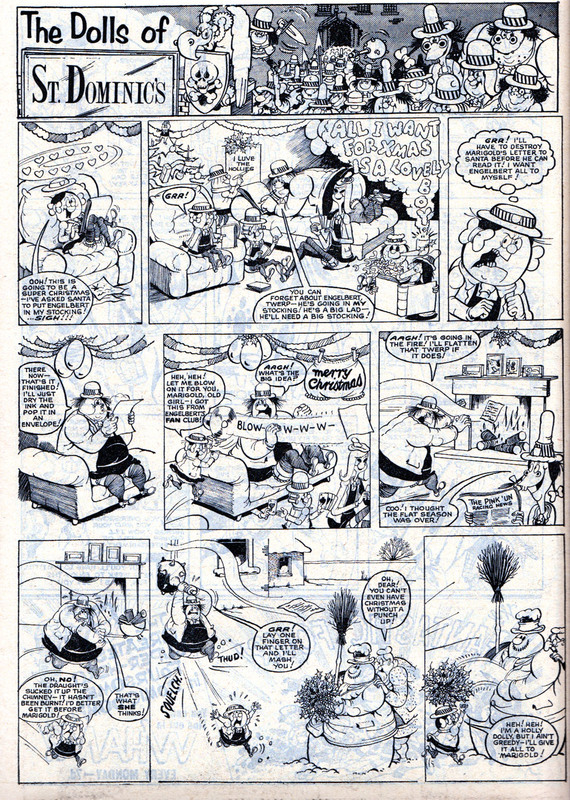 characters gathered for the party in the final panel, including Mike Higgs himself (or 'MiK' as he signed his work then). 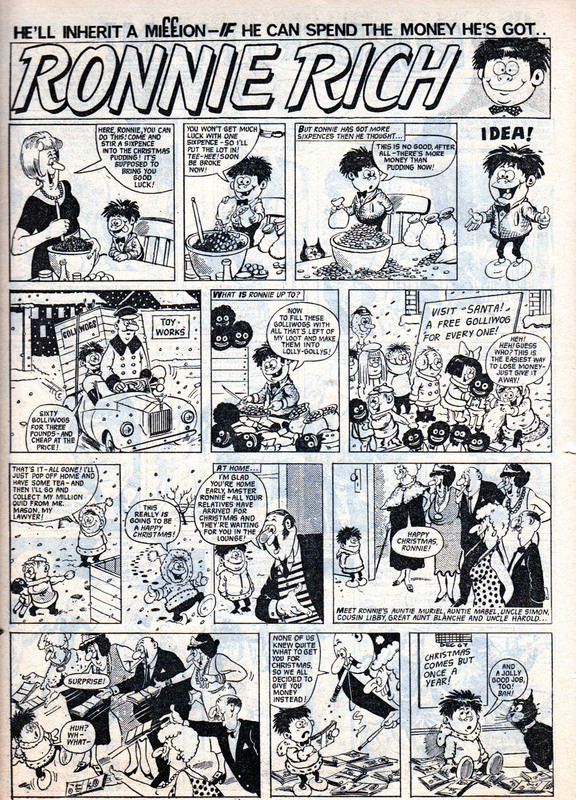 The other standout strip of that issue was Dare-a-Day Davy in its regular back cover slot. 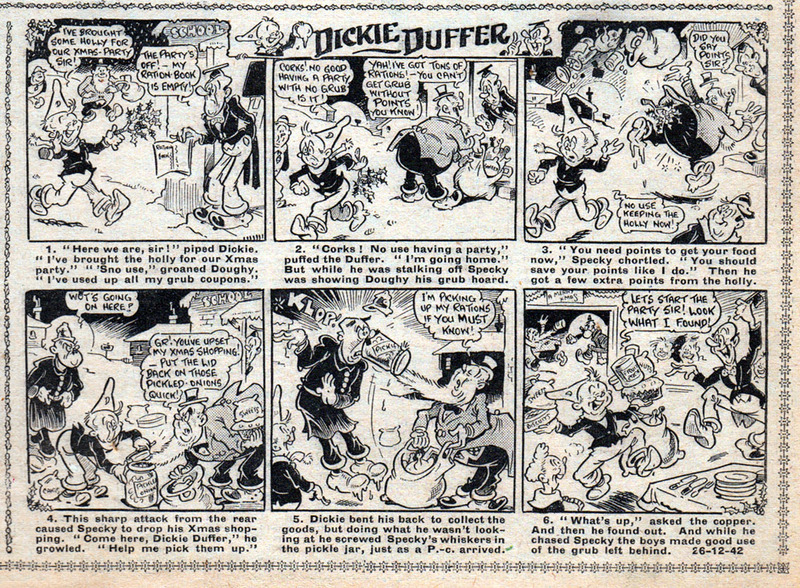 Artwork by Ken Reid, who was always a great artist but by the 1960s had reached new heights of genius. 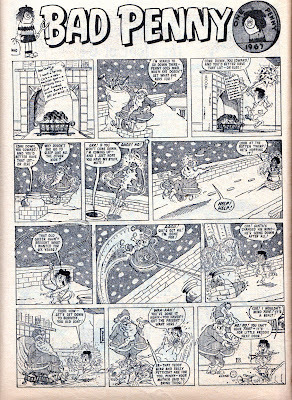 People may criticize modern humour comics for not reaching Ken's standards but the truth is no one could touch him back then either. 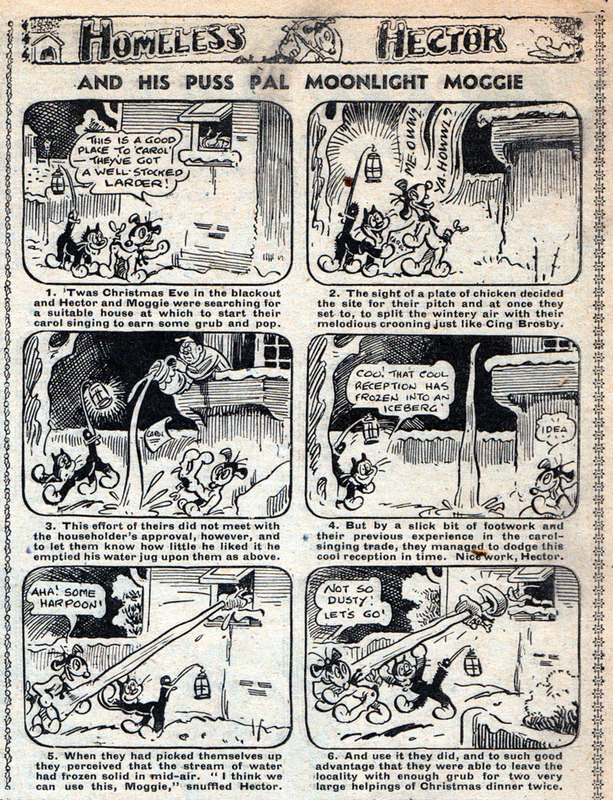 Ken Reid was always in a league of his own. 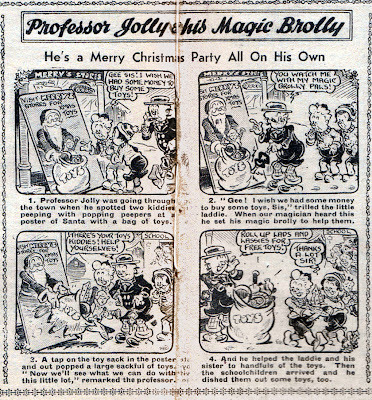 Tomorrow: The penultimate Christmas classic. 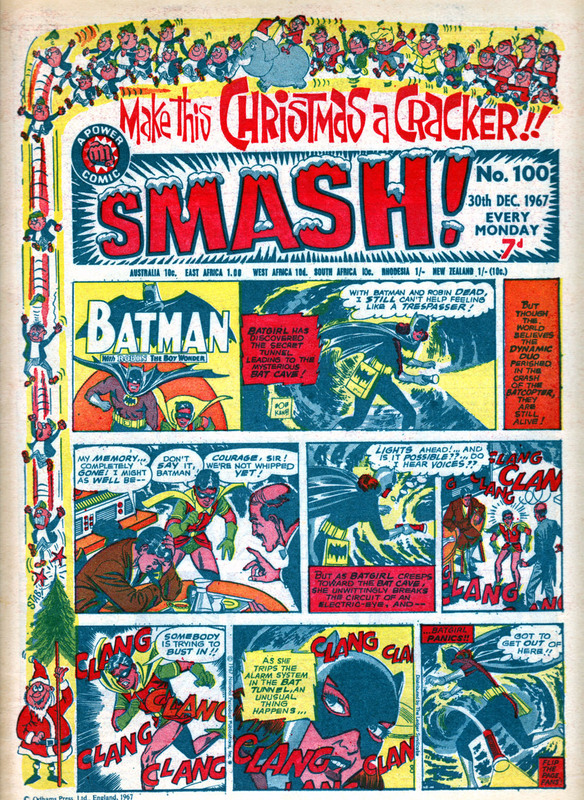 I've already covered the 1966 Christmas issues (and blogged about the 1968 one two years ago) so now here's the 1967 Christmas Smash! 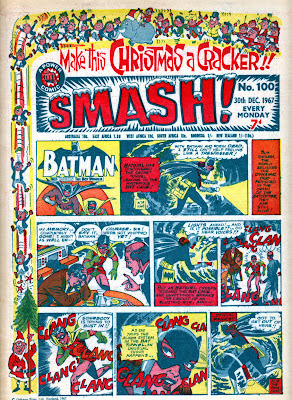 The addition of the Smash characters herding Swots towards a fate worse than death livened up the usual Batman cover and that large topline is very effective. 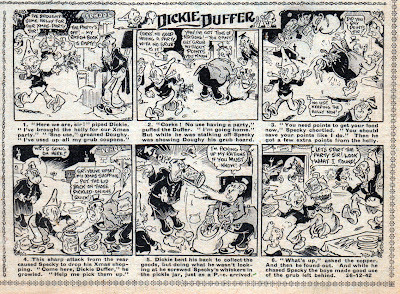 Inside, the Bad Penny strip is by one of the artists who was encouraged to approximate Leo Baxendale's style. 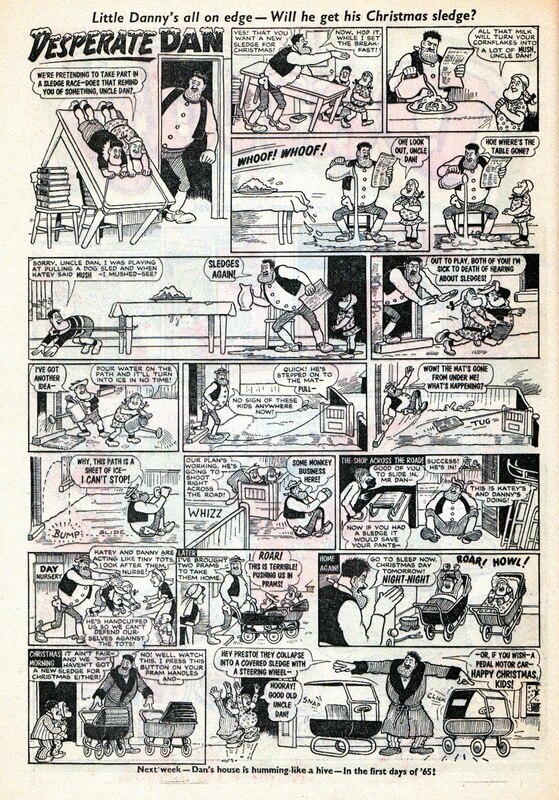 At first glance I thought this might be by Mike Lacey (some of the hands and faces are similar to his work) but the overall look of the strip is a little too crude to be Lacey's polished work. 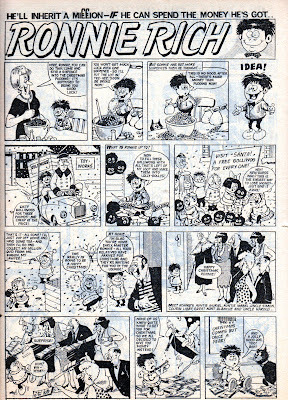 Some have suggested it's by Bob Dewar attempting the Baxendale style, but I don't really see much of Dewar's style here, apart from Penny's grin in panel 9. 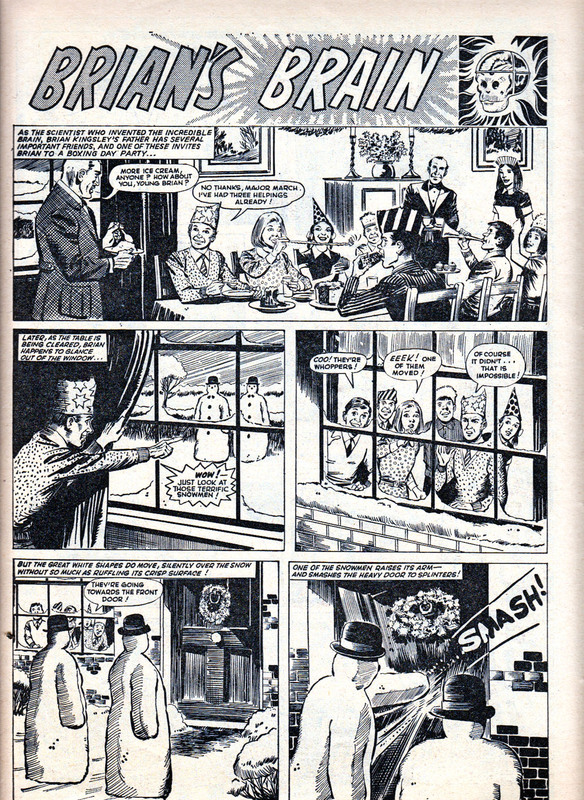 At any rate, it's a busy strip and, as a treat for the Dads, there's a glimpse of Penny's Mum in a see-through nightie, although we discover she wears bigger pants than Bridget Jones. As an example of how Smash's humour strips literally sat alongside Marvel reprint, here's a spread showing Stan McMurtry's Percy's Pets opposite a page of Wally Wood's Daredevil. 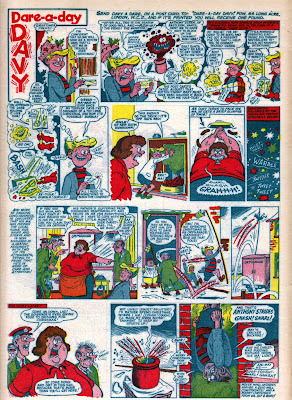 Growing up with comics like this is why myself and others have always considered UK humour strips of having equal merit as American comics. 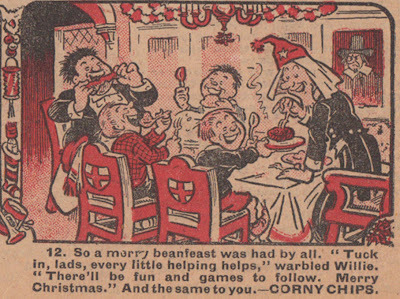 Christmas is coming... and so is another festive flashback, - later today!